We asked 100 campaigns about their crowdfunding video to learn what works, what doesn't and how much to spend. If we told you that you only needed to spend $1,000 on your crowdfunding video to get $1,000,000 in pledges, you might laugh with joy. And if we told you that you might spend $10,000 and only get $5,000 in pledges you might cry. Truth is, both these things happened to someone in 2016, and neither is the norm. We surveyed 100 recent hardware crowdfunding campaigns - join us as we look at how much they spent, what tone they set, who and what they featured, and what impact it all had. Budget: Video budgets range from $0k to $100k, and increase with campaign size: most $25k campaigns spend between $0 and $3k on their video, most $100k campaigns spend between $2k and $6k, most $1M+ campaigns spend $20k+. Length: The ideal length is around 2:00-2:30 minutes. Success rate drops off significantly for videos over 4 minutes long. Mood: Friendly and Upbeat tones tend to perform better. Comedy and Drama are risky. Timing: Most successful campaigns take at least 4 weeks to make their video. Don't rush it. 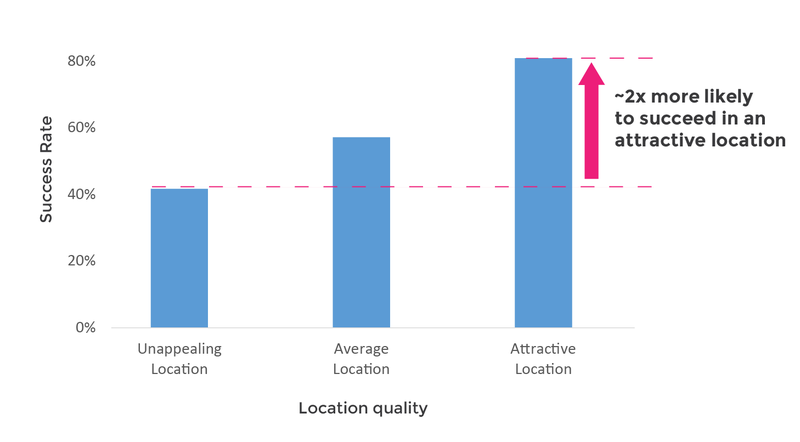 Location: Appealing locations were ~2x more likely to succeed; location scouting is worthwhile. Image quality: Videos with rich / well composed visuals did much better. Founder presence: Founders don't have to pull a huge performance, a short cameo works just as well. 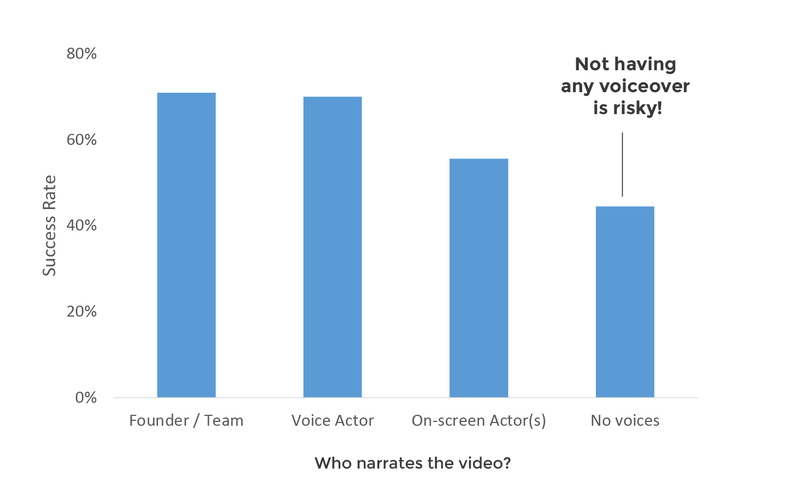 Narration: You can have the video narrated by a voice actor, or by the founders, but having zero narration tends to hurt success rates. Outside help: Most campaigns that raised above $100k chose to hire video professionals for the production of their video. Budget - How much should you spend on your video? Video budgets vary widely, from $0k to $100k, reflecting very different objectives and resources, from bootstrapped weekend projects to well funded startups ready to ship. 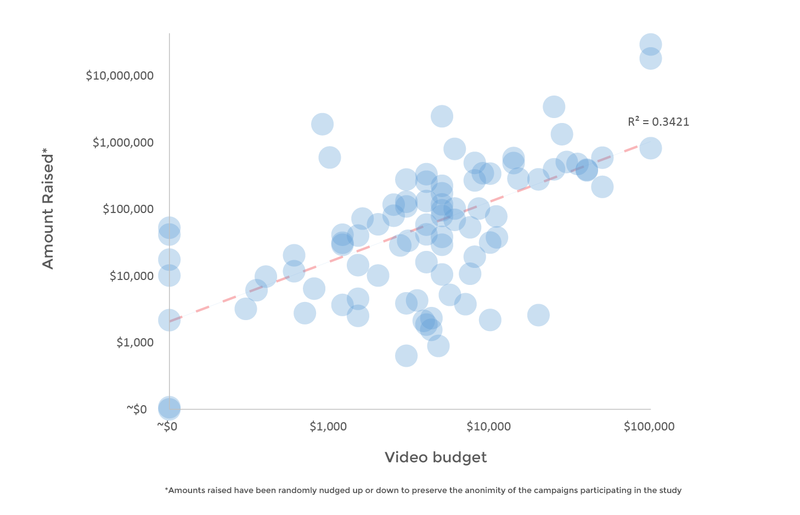 The average campaign spends real money on their video: ~$10k when looking at the mean, ~$5k median. This is enough to hire an experienced crew with quality equipment - an indication that Crowdfunding has professionalised over the years. 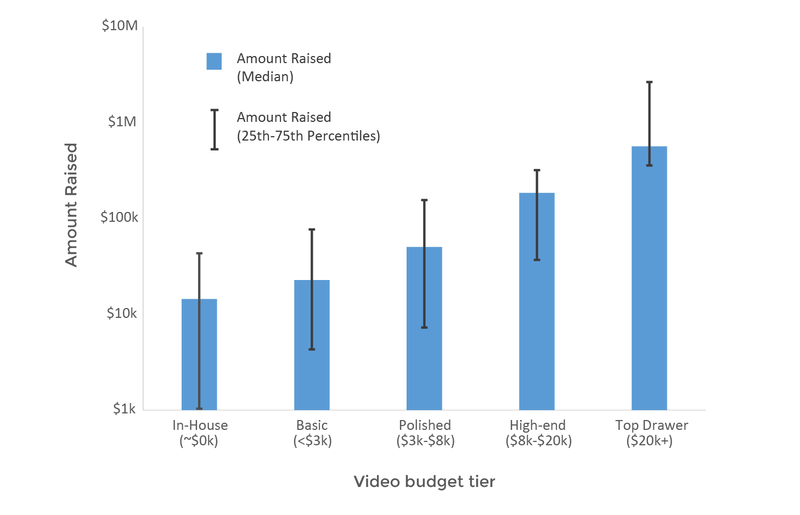 But how do video budgets actually affect outcomes? Do fancy videos perform any better? Let's first look at the relationship between budget and amount raised. Looking at this chart it is tempting to focus just on the trendline and to conclude that "expensive videos raise more money". While this is true in aggregate, the reality is that there's a lot of variation around the trend (R2 = 34%, which is low). This data can help you benchmark against other campaigns, but it shouldn't be read as a prescription to spend. What's right for the average campaign may not be best for yours. Here we can see even more clearly the correlation between video budget and the amount raised. But correlation does not imply causation – spending $20k on a video is not an automatic ticket to raising $1m. 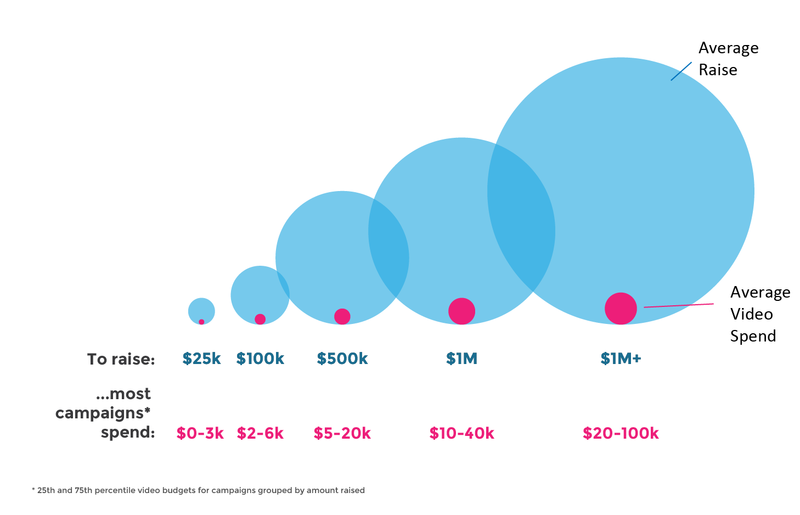 A more practical way to interpret the data is: if you plan on raising around $1m then be aware that most campaigns that have done that in the past have spent $10k+ on their video. So if you're planning on spending less than that you should be asking yourself, "what makes my circumstances different with respect to video?" Now lets look at the relationship between video budget and success rate. 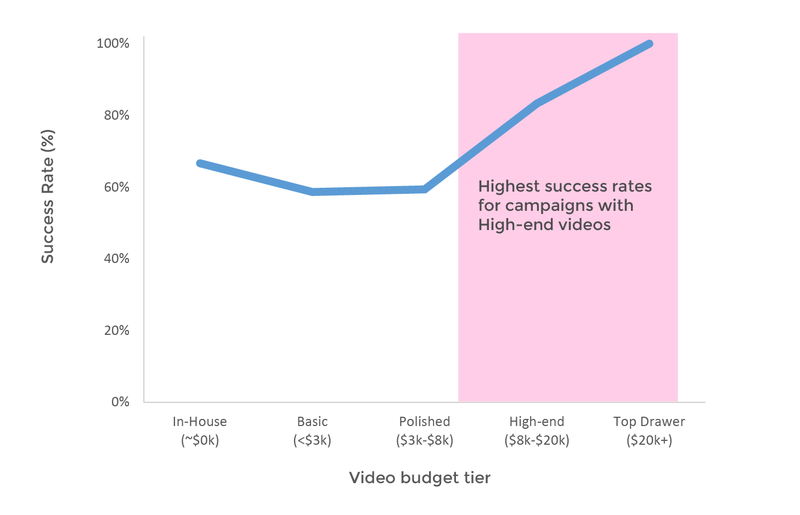 The patterns we clearly see is that campaigns with high-end videos are less likely to fail. That could be because a nice video inspires trust, at a time when backers are growing weary of crowdfunding busts. But more likely it's because bigger video budgets tend to be for projects that are further along in their development, that have received some market validation already, and that are able to offer more tangible higher-priced perks, thus having an easier time reaching funding goals. Invest in your video. In aggregate, making a nice video pays off, the ROI is positive without apparent diminishing returns. You can succeed on a shoestring budget. Some campaigns have raised >$500k and spent only $1k on the video. It's not the norm, but it happens. Smaller campaigns can consider making their video in-house, especially if your team has prior video experience. But if you plan to raise more than $100k then hiring professionals is probably safer. If you want to be in the Crowdfunding Hall-of-Fame and break above $2.5M in pledges then prepare to spend a lot on your video. To raise $25k, plan on either making the video in-house or on spending <$3k for a simple founder interview + b-roll, filmed over a half day, and edited simply. To raise $100k, plan on spending between $2k and $6k on the video, to hire an experienced director with a small crew to make a video with clean attractive visuals following the classic crowdfunding video template. To raise $500k, be prepared to spend between $5k and $20k on the video, which will let you add a professional scriptwriter, actors/models and location scouting. To raise $1M+, be prepared to spend between $20k and $100k for top-drawer work. These are just guidelines, and you'll want to adjust based on the specifics of your campaign. For example you should probably spend above average if you have the sort of brand that can benefit from a glossier look, and a more complex production. Whereas you should probably spend less if your product is self-explanatory and you are able to take on more of the video production responsibilities yourself. 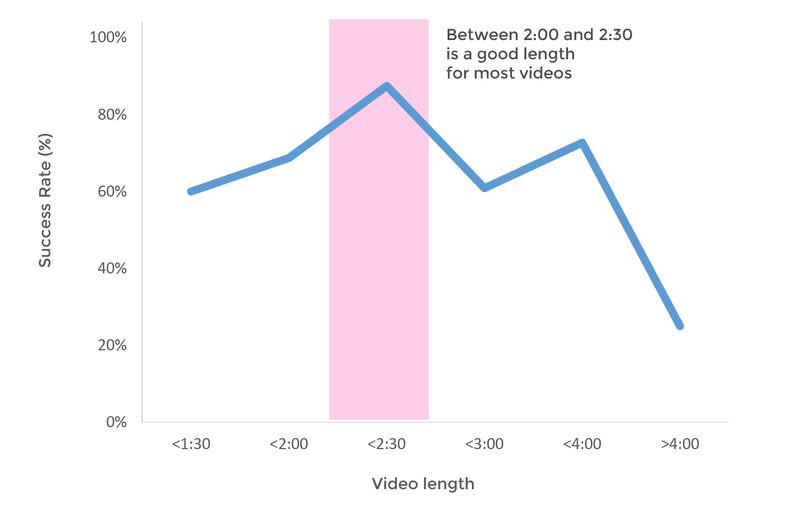 Length - How long should the video be? There is a sweet spot in the 2:00 to 2:30min range. Videos in that range had the highest average success rate, and going a tad shorter or longer seems to make only a small difference. 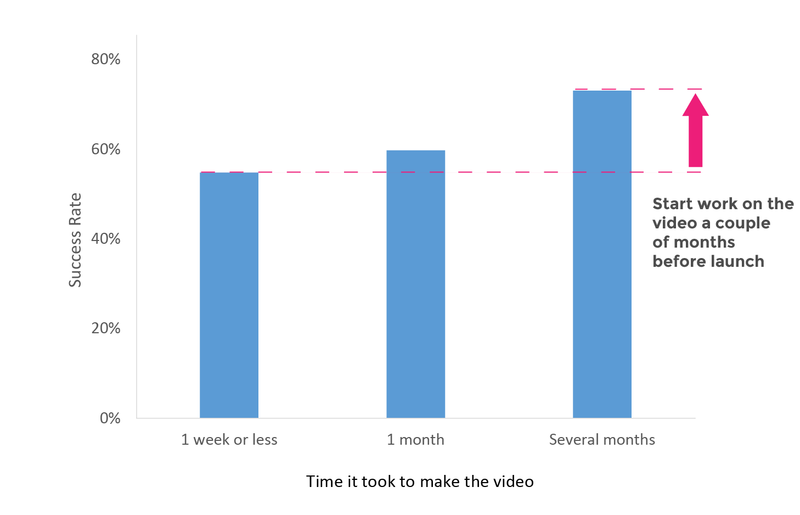 However we see significantly lower success rates for videos 4+ minutes long! We found that longer videos (3-4min) can succeed just as well if they use the first minute of the video to talk about the product to capture the audience's attention, then use the later minutes to dive into the details (team, history, plan). Introduction - When to reveal your product? 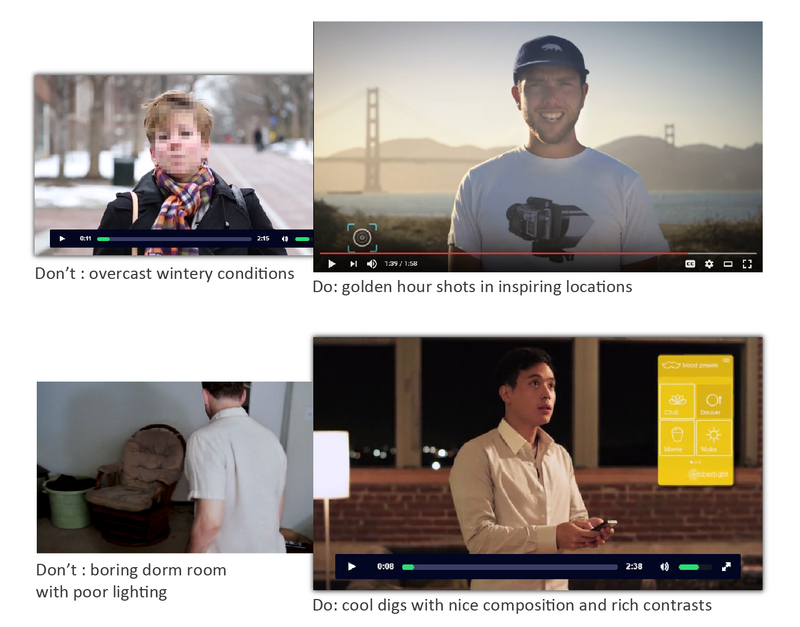 Some crowdfunding videos jump right in and reveal their product within a few seconds. Others first describe the problem first, and then show the product as the "solution". Deciding between a product-first and problem-first can feel arbitrary and subjective. Videos that revealed the product between the 10s and the 20s marks achieved the highest success rate. They briefly showed us the problem (<10s is a quick setup) and then wasted no time in showing the product. 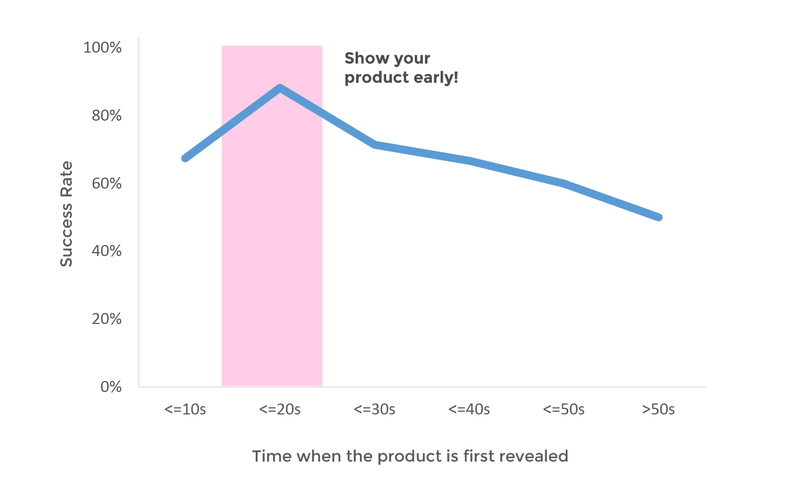 Campaigns that introduced the product immediately (before stating the problem) performed slightly worse, as did campaigns that waited 30s to reveal the product. Campaigns that waited more than 30 seconds had progressively worse success rates as the time increased. It'd be interesting to see how these numbers change for non-hardware campaigns, where it's much harder to "reveal" the product in one go. Mood - Which tone/mood should you aim for? You may be wondering if your video should be Funny or Serious? Upbeat or Zen?... choosing the mood for the video can feel arbitrary and subjective. In our sample we found that videos with either upbeat or friendly tones had very high success rates. Upbeat or friendly seems like a safe choice for a Hardware Kickstarter video. Funny is riskier. Funny can work beautifully just like the Font Awesome kickstarter video recently made on Videopixie. But Funny can also backfire if it's not done right. You'll want a team that "gets" humor and they'll need enough budget and creative license to run with their vision. Passionate tones are also seemingly riskier. Transferring your enthusiasm to your audiences is not an easy task. Production - How long does it take to make a good video? We often get asked how long it takes to make a crowdfunding video: a week, a month, several months? The answer depends on the complexity of your production, but in general we advise to plan for at least a month. 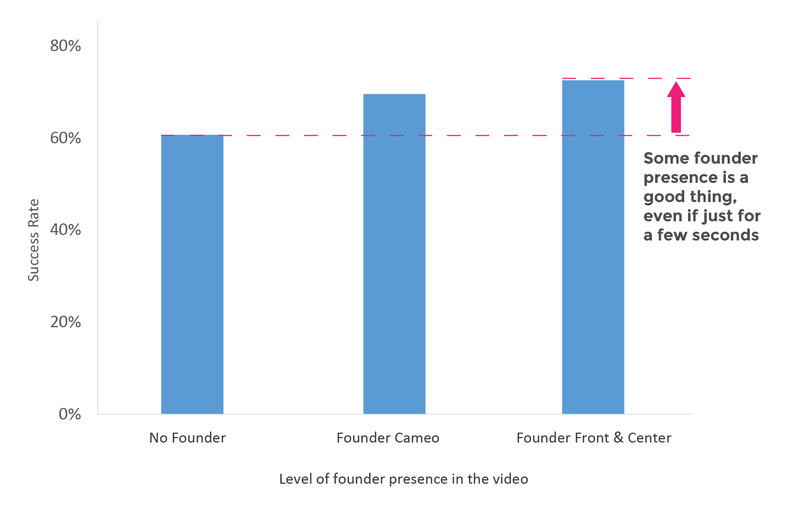 Founder Presence - Do I really need to be on camera? Do you feel shy in front of the camera? We have good news for you – you don't have to take a huge role in your video! Some founder presence definitely helps, but you don't have to subject yourself to the dreaded "founder talking head" routine, nor make yourself the focal point of your campaign – not unless it truly adds to the video. We saw only a small benefit from having the founders "front & center". Founders who make just a small cameo appearance still had high success rates. On the other hand videos without any founder presence performed poorly, probably due to the lack of authenticity. Bottom-line, make sure you design your video with viewer engagement in mind. Authenticity is important, but there more engaging ways to be authentic than to subject your viewers to long – possibly boring – founder monologues. Narration - who should narrate your video? The most important learning here is that there needs to be a narrator! Videos without voice had a much lower success rate on average. The voiceover can be recorded by anyone: founders, team members, or voice actors. It doesn't make a huge difference. This is good to know for teams who dont speak English as a first language. Don't hesitate to hire a voice actor if it helps comprehension, just so long as they don't sound like a radio commercial for a used car! Hiring outside help - Should we make the video in-house or hire pros? 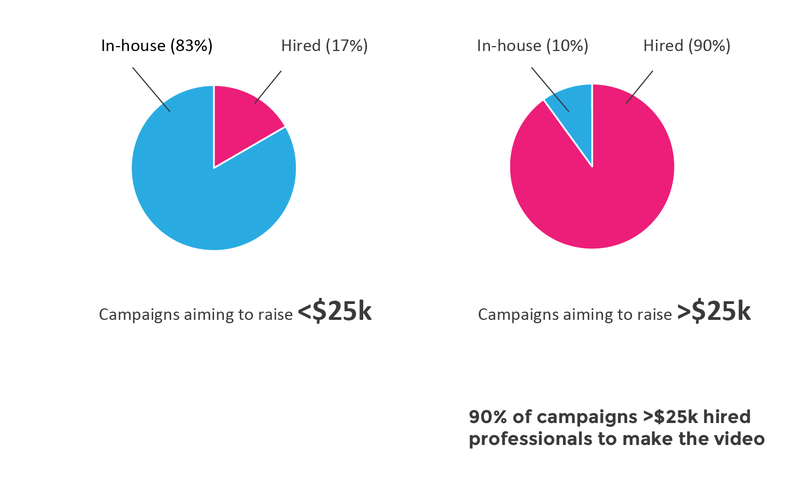 We found that the majority of campaigns hired outside help to make their videos. Those who made the video in-house had a solid success rate, but the amount they raised didnt exceed $100k, and they tended to have prior experience producing video. Location - Where to film? Location attractiveness plays a huge role – more than we had expected. Regardless of your budget make sure you spend time finding an interesting stage. Avoid dull office spaces and bare-bone dorm rooms. Your surroundings reflect the perceived quality of your product just as much as the looks of the product itself. Use the backdrops to set the mood/energy of your campaign. Image Quality - Do I need cinema-grade equipment? 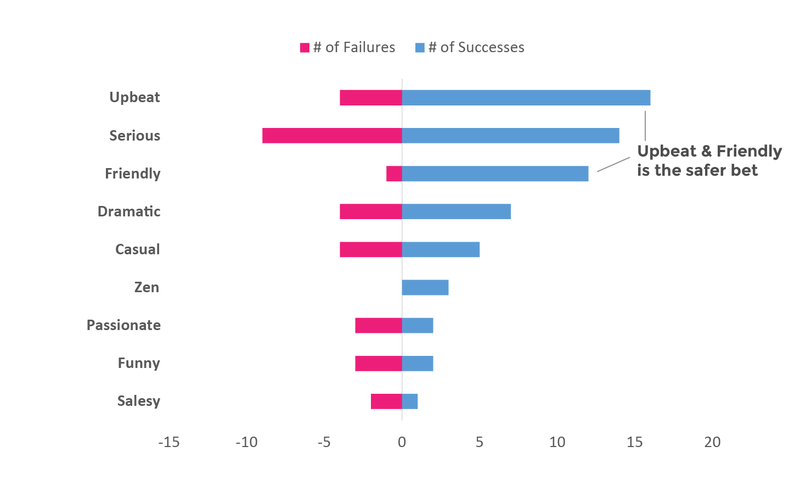 Lets look at the relationship between image quality and success rate. 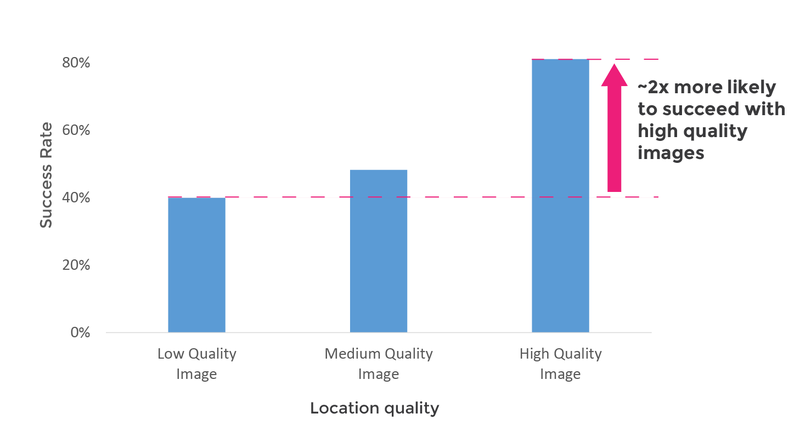 We found a 2x difference in success rates for campaigns with higher quality images! This is unlikely to be entirely causal, and it's likely that the video budget is a 3rd hidden variable at play here. But given the relative ease of capturing good visuals, why take the risk? Make it a requirement that the shots are are well lit, steady, focused and with appropriate depth of field. Finally we have good news for those who did want to geek out and invest in fancy video accessories. You are validated! 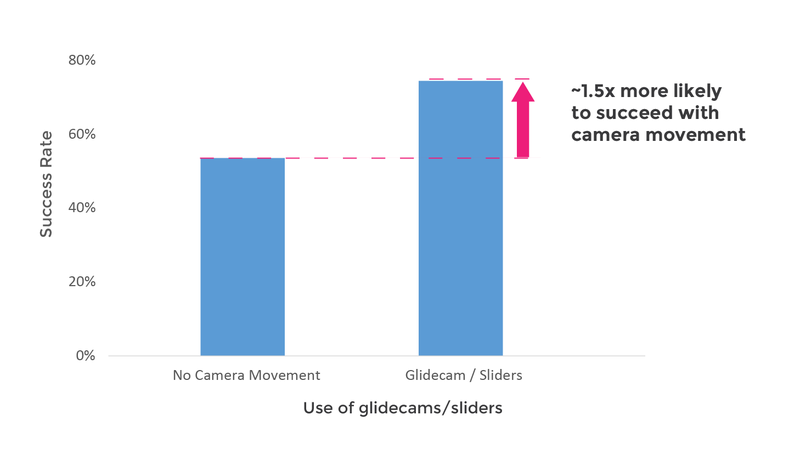 We found that videos that made use of glidecams and/or sliders to add camera movement did better on average! This was our 2016 Videopixie Crowdfunding Video Benchmark! We hope the data helps you decide on your video's budget, length, voice, mood, locations and more. If you have video design questions or suggestions please let us know in the comments or email me thomas@videopixie.com - we have plenty more data and opinions to share. Also check out: The 7 secrets of great crowdfunding videos for more tips, and this selection of the best Kickstarter/Indiegogo videos to spark your imagination. About our sample: We want to thank the 100 campaigns that participated in the survey and shared their video secrets with us. The campaigns are recent 2016 tech hardware campaigns. One third were randomly selected from Indiegogo and Kickstarter listings. Another third made their videos with a creator on Videopixie. The remaining were targeted specifically to cover the full range of campaign sizes.